Online marketplace eBay announced today that it plans to intermediate payments on all eBay marketplaces in the coming years. 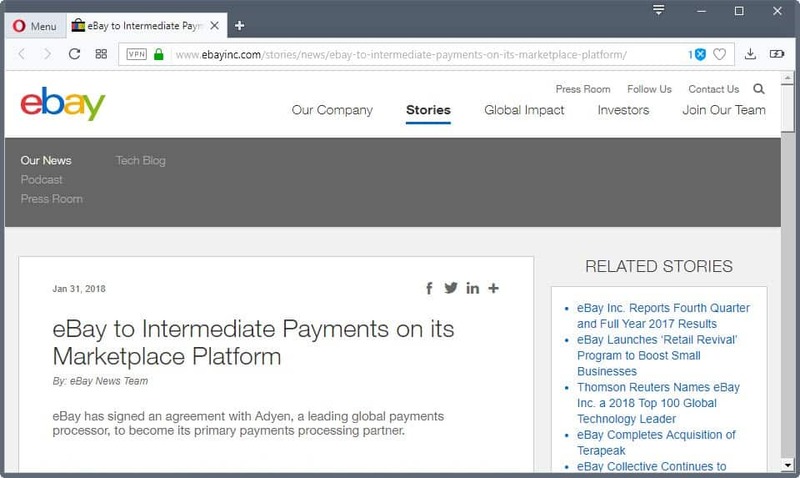 The company signed an agreement with global payments processor Adyen which makes Adyen the primary payments processing partner on the eBay platform. Adyen is a Dutch-based global payment processor. The company processes payments for Internet heavyweights such as Netflix, Uber, Etsy, Groupon, LinkedIn or Booking.com already. eBay's main goal is to manage payments directly. The company notes that the transition will take years but that payments intermediation will launch "on a small scale in North America in the second half of 2018". eBay plans to expand this in 2019 and migrate the majority of Marketplace customers to the new "payments experience" in 2021. PayPal, eBay's current primary payments processor, will become one option when it comes to making payments on the platform. eBay notes that PayPal will remain an option to pay at checkout until at least July 2023 as both companies signed an agreement. As a customer, PayPal may appear to be an on-the-platform payments experience already but ever since eBay and PayPal parted ways, eBay is not control of payment processing as PayPal handles that end of the transaction. eBay points out that the move to intermediate payments has benefits to sellers and buyers. The company promises that most sellers may expect a reduction in payment processing costs, a new central place to manage all of their business, and a greater buyer reach and improved conversion. Buyers on the other hand get another payment option at checkout and an integrated checkout experience. Sellers should expect "to provide eBay with some additional payments-related data and transition to a new relationship with eBay that includes integrated payments", so eBay. eBay's move to intermediate payments gives the company more control over its marketplace and moves it in this regard to a similar level of control that Amazon has on its marketplace. PayPal appears to be on its way out. While that won't happen in the next year, 2023 might see eBay dropping PayPal from its marketplace altoghether in favor of the fully integrated payments solution. Now You: Do you buy or sell on eBay? Should you use eBay's Valet service to sell items? I buy stuff on eBay when I have a hard time finding it elsewhere (probably 2 or 3 purchases a month). Since I have a PayPal account, it makes it extraordinarily convenient. If it become less convenient in five years, it might reduce the amount I buy there — but maybe not, since it’s pretty much my place of last resort to begin with. I like ebay and use it a lot for purchasing used goods if descriptions and photos seem accurate. Last year’s top of the line sporting goods are usually the same as this year’s, just different paint, some items are essentially new, good deal! Don’t understand how Adyen is different than PP; I use credit cards, PP only if there’s no alternative. Had a PP/ebay dispute years ago and am convinced a real human being was involved nowhere in the resolution; but then ebay seems run by bots too. “Good news! Your case has been resolved successfully, the seller will not refund your payment.” Wow, what do they consider bad news? Even so, I still frequent ebay, just a little smarter now. Adyen requires the customer to enter credit card no. with every transaction. There is no way I will use the service. May as well just use a credit card directly, skip sellers who won’t accept one. PP et al are very convenient (too convenient, $$$) but only save some typing. What are you even talking about? “May as well just use a credit card directly, skip sellers who won’t accept one.” The point of the article, the news, is that buyers will no longer be paying sellers, period. Instead, buyers be paying eBay; eBay will disburse payments to sellers, minus selling fees. It’s reasonable to expect that eBay will “keep on file” cc as part of the user’s ebay account info… and will farm out transaction processing to Ayden. Where does your expectation “requires the customer to enter credit card no. with every transaction” come from? Lookit, Ayden is handling payments for Netflix (article says so)… but Netflix subscriber isn’t required to ” enter credit card details with every transaction”, right? I don’t think that’s a reasonable expectation at all. I would expect Ayden to keep the cc on file, not eBay (exactly like PayPal does right now). One of the primary advantages to consumers for using payment processing service is that the vendors themselves don’t even learn, let alone retain, the cc number, so it minimizes the attack surface presented to hackers. Also, I haven’t bought anything via ebay – allegro dominates here. EB doesn’t profit any more from the hurt Paypal puts on buyers: heavy cost and security all in favor of the buyer. They used to but not anymore. Maybe they hope to engage more sellers. I prefer Amazon because of free shipping and the one click payments. But eBay is useful for hard to find items sometimes. If eBay eventually cuts out PayPal, it’s likely that I’ll be looking for alternatives too. PayPal is easy to use and I don’t have to type in my credit card info every time. They should not have sold PayPal.